97% of the United States is covered by rural areas, and one-fifth of all Americans live in these areas. Major metropolitan centers attract most of the resources, however. That includes the lion’s share of doctors, dentists, psychologists and health care facilities. It’s hardly surprising, then, that urban Americans also have better health outcomes. To address this disparity, every state in the nation has a government office of rural health. 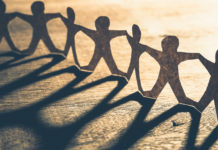 Most also have a state rural health association, a telemedicine resource center and a variety of research institutes and charitable foundations dedicated to helping our most isolated and vulnerable citizens gain access to care. But these efforts, however warranted and welcome, are not equally effective. Some states do an impressive job of providing rural health care while others fail to provide care that is even remotely comparable to the care provided in their urban centers. It’s not clear, however, that individual states deserve all the blame or praise. One of the more surprising revelations of this first annual RHQ Rural Health Report Card is the recurrent theme of regional clustering. Across the nation, it’s clear that rural health strengths and weaknesses don’t occur in isolation. There are strong regional trends at play. We don’t attempt to fully explain these trends, but we hope some of you will take notice and take action. Maybe if we reach out more, across state lines, we can forge new alliances and find solutions that will benefit all rural Americans. RHQ’s U.S. 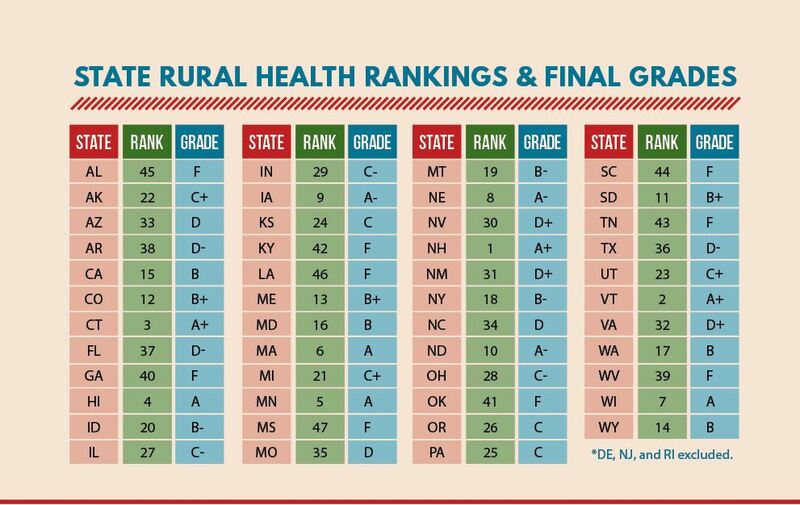 Rural Health Report Card was created to answer a simple question: How does each state’s rural health care stack up when compared to other states? It seemed like a fairly straightforward question, and a useful one, too. How do you know if your state is doing an adequate job without a baseline for comparison? You can’t manage what you don’t measure, right? It quickly became clear, however, that finding a satisfactory answer to this question would be a challenge. First, we had to settle on definitions of “rural” and “rural health.” We weren’t trying to quantify all health care in America, just rural health care, and just rural America. But which rural America? Second, we had to determine which factors to measure and which ones to exclude. That’s harder than it sounds if fairness and utility are your ultimate goals. Suffice it to say, we had some pretty spirited discussions. Finally, we had to assign weight to everything we measured. All things are not equally important. That means conscientiously ranking the relative importance of many important things. After many months of discussion, analysis, research and reflection, we finally found consensus, equilibrium and even a sense of satisfaction. 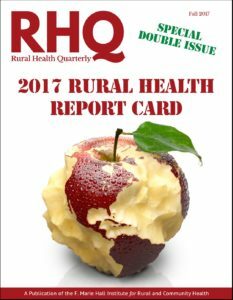 We hope you agree that the RHQ Rural Health Report Card is a fair and useful document. If so, please let us know. We plan to make it an annual affair. If you have suggestions or criticisms, please let us know those, too. When it came to defining rurality, we settled on counties as our sole unit of measurement. This had the virtue of allowing us to use well-established and reliable data sources. It also helped us ensure a greater measure of fairness; i.e., we would always be comparing “apples to apples,” regardless of data source. That did mean excluding three states and Washington D.C. from our study, however. While Delaware, New Jersey and Rhode Island each contains pockets of rurality, these states, like D.C., are largely urbanized, and none contains a single county with a non-metropolitan population. Following a discussion with the USDA, all the counties in the remainder of the states were sorted as either metropolitan (urban) or non-metropolitan (rural) as defined by the 2013 Rural-Urban Continuum Codes (RUCC). RUCC distinguishes metropolitan counties by the population size of their metro area, and nonmetropolitan counties by their degree of urbanization and adjacency to metro areas.1 Rural-urban commuting area (RUCA) codes, another common measure of rurality, classify U.S. census tracts using measures of population density, urbanization and daily commuting. RUCC was deemed a more appropriate measure for our analysis. A final composite score was then given to all rural counties individually. The overall composite scores were calculated using 10 variables divided into three equally weighted categories: Mortality, Quality of Life and Access to Care. Mortality includes age-adjusted mortality rates for all causes of death in all rural counties in a state. 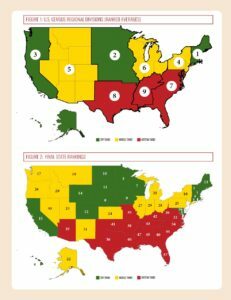 Mortality accounts for 1/3 of each state’s final composite score. Quality of Life includes the percentage of babies born in rural counties with a low birth weight, the percentage of rural residents who reported having poor general health, the number of poor physical health days reported by rural residents in the past 30 days and the number of poor mental health days reported by rural residents in the past 30 days. Each state’s combined Quality of Life score accounts for 1/3 of that state’s final composite score. Access to Care includes the number of non-federal primary patient care physicians practicing in rural counties in 2014 per 100,000 population, the number of non-federal psychiatrists practicing in rural counties in 2014 per 100,000 population, the number of dentists practicing in rural counties in 2015 per 100,000 population, the number of non-federal emergency patient care physicians practicing in rural counties in 2014 per 100,000 population, and the percentage of uninsured rural residents under 65 years of age. Each state’s combined Access to Care score accounts for 1/3 of that state’s final composite score. A variety of measures and data sources related to U.S. health care were reviewed for this study, and it was decided that the three categories and ten variables listed above would best portray an accurate picture of the state of rural health across the nation. While various social determinants of health are discussed in the individual state report cards that follow, the 10 variables listed above were the only variables used to compute each state’s final composite rank and grade. 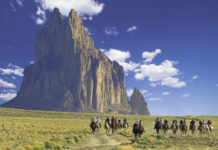 Other well-known national health rankings, like the County Health Rankings (CHR) model produced by the Robert Wood Johnson Foundation, rely heavily on a more holistic view of population health, but the RHQ Rural Health Report Card focuses instead on a narrow band of data related specifically to rural health outcomes and access. This choice should not be interpreted as a criticism of other models. Rather, RHQ’s approach takes as a given that social and economic factors exert a powerful influence on health. Our report card instead seeks to highlight a limited set of key variables in an attempt to create a clear snapshot of state and regional differences in rural health care delivery. Each state was given a letter grade based on calculations using a Z-score. 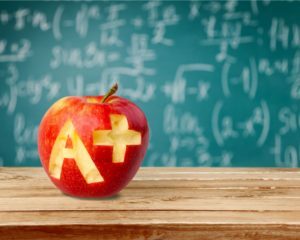 Grades were put into five traditional American grading categories: A, B, C, D and F. Positive and negative delineations (+ and -) were added to each letter grades except F to indicate the top three and bottom three performers in each quintile. Z = (state value – average of all states) / (standard deviation of all states). A positive Z-score indicates a value higher than the average of all states; a negative Z-score indicates a value for that state lower than the average of all states. Z scores for physician supplies (primary care physicians, dental, emergency care and psychiatrists) are reversed; i.e., a positive value is reversed to a negative one and negative one to a positive value. Of the 47 states reported, each grade was based on their overall quintile ranking. The key findings for each state are summarized in each of the individual state report cards (PDF). In the left-hand column, each state’s final grade and overall rank are given, followed by a listing of each state’s final rankings in each of the three equally weighted categories. Also on the first page of each report card, a breakdown of each state’s U.S. Census divisional ranking is supplied, followed by a brief overview of rural health in the state, an account of the number of rural health facilities in the state and a calculation of the urban-rural divide in mortality rates. Rural/urban difference is defined as the result of the z-score of rural counties minus the z-score of urban counties of the same state; the county with the smallest value is ranked the highest. On the second page of each state report card, a map of rural and urban counties is provided, along with a “by the numbers” list of facts about each state’s rural residents and highlights from the final scores received by the state in each of the three categories measured to calculate the state’s final grade. Note that not every category of measurement is described at length on every state report card. 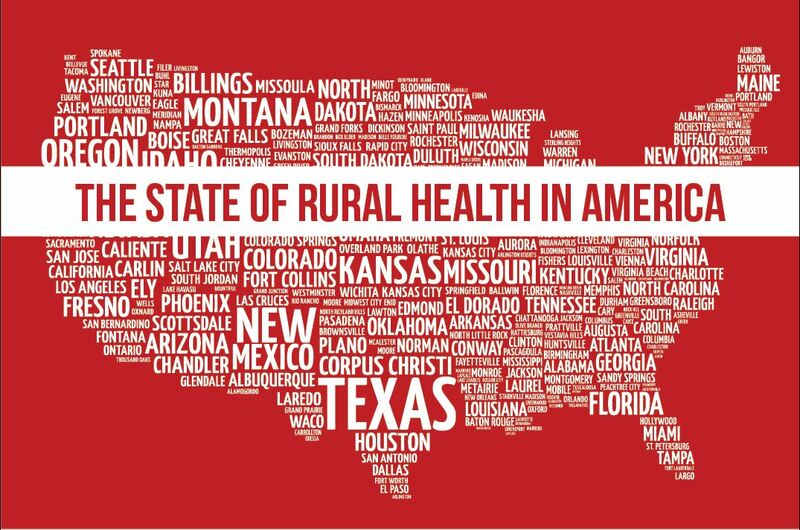 For a more complete breakdown of each state’s performance in all measures, download the 2017 RHQ Rural Health Report Card National Data Workbook. Finally, we wanted to provide a clearer picture of the phenomenon of regional clustering mentioned in our introduction. In Figure 1, all nine U.S. Census regional divisions are numbered and color coded based on their final average rankings. The top third (green) and middle third (yellow) appear to alternate positions across the northern half of the United States. Note, however, that the yellow states surrounding the Great Lakes are actually comprised of two different U.S. Census divisions, the East North Central (Illinois, Indiana, Michigan, Ohio and Wisconsin) and the Mid-Atlantic (New Jersey, New York and Pennsylvania). Both divisions fall into the middle third of divisional ranks and their adjacency contributes to the green/yellow zebra-stripe effect. The bottom third (red) regions in our rankings are all adjacent, and all are located in the American South. Remarkably, a similar pattern emerges when divisional averages are removed and all individual states are color coded based on their own unique final rankings (Figure 2). When we compare Figures 1 and 2, seven states move one position, either up or down among the color-coded thirds, but they tend to do so only when adjacent to a state of the same color. Arizona is the only exception to this rule among the contiguous states. Only two states move two positions: Maryland rises from red to green, and Missouri falls from green to red. It’s hard to know what to make of this persistent grouping of states, but it seems clear that location is a strong predictor of success (or failure) when it comes to rural health care. Further research on regional trends may be a fruitful avenue of inquiry. Health Resources and Services Administration of U.S. Department of Health and Human Services. 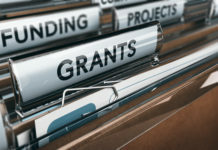 This research was supported by the Texas Tech University Health Sciences Center and the F. Marie Hall Institute for Rural and Community Health. We thank our colleagues who provided insight and expertise that greatly assisted in the creation of the RHQ Rural Health Report Card, including Billy Philips, Catherine Hudson, Gordon Gong, Debra Curti, Luciano Boas, Miguel Carrasco, Melanie Clevenger and Hope LaFreniere. Please direct all inquiries to RHQ editor in chief Scott G. Phillips at RHQ@ttuhsc.edu. 1 An earlier version of this article stated that Rural-Urban Continuum Codes define a county as rural if it has a population under 50,000 people. This is not always the case, however. A U.S. county with a smaller population may be coded as metropolitan (urban) if it is adjacent to an urban county. This clarification in the definition of Rural-Urban Continuum Codes does not alter or otherwise impact the report card rankings or grades. We regret the error. 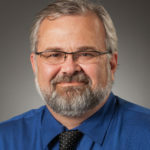 Scott G. Phillips is editor in chief of Rural Health Quarterly.